Attract local customers in your city and the surrounding area who are searching for your products and services. Have your website found on the 1st page of Google within 90 days! Learn more about our Local Business Listings today! Captivate your visitor's attention with an appealing and highly engaging website. Create an impression that will encourage your visitors to learn more about your business. Find out more about our Creative Website Design Services today! Position your website to be found, gain traffic and attract new customers to your business in the most cost effective and lasting method of making your website an online success. Learn more about our Organic Search Results today! 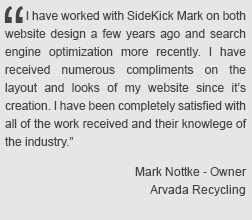 SideKick Mark provides professional Internet marketing and website design services. Our team has the experience and the know-how to rapidly grow your online business! 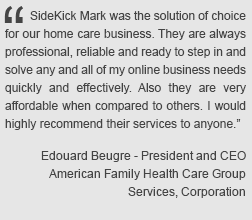 SideKick Mark’s depth of talent and experience will harness the “power of the Internet” to attract an increasing amount of search traffic to increase the number of new and qualified buyer visits and facilitate sales performance breakthroughs. Our search optimization techniques will drive new potential buyers to your website so they can get the information they need to make a buying decision. Attracting more customers to your business can now be achieved! Internet marketing is one of our best skill-sets. We will position your company to be easily found by an expanding base of new potential customers. 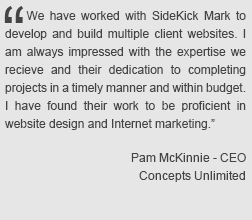 Our design and branding approach integrates pro internet marketing and website design services. We want your site to achieve the performance results so that it becomes your most successful sales team addition. Your website should be designed to convert new visitors to new sales! We build selling-compelling websites! They are beautiful, effective, and informative! 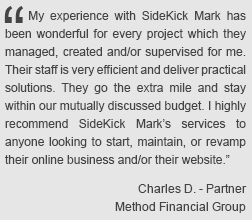 We build sites that are credible and build customer trust! They are loved by Google, Yahoo and Bing! We will build you a search engine friendly site that will work… and work… and work!